Religion attempts to uncover that mystery with creation stories. Primitives and ancients told stories of the beginnings of the earth; many tell of humans coming out of the dirt and mud of the earth. The first Chapter of the Book of Genesis in the Hebrew Bible is such a story. Many Christians believe it is the story of creation. Nevertheless, to be objective, Christians must admit there are other and similar creation stories, and the Genesis story, as do all the others, does not withstand the scrutiny of science. The Genesis story reflects the knowledge of the universe as it was understood in early historical times. Nonetheless, for the first time in human history, and over the briefest spans of time, we know more about the universe than we ever did. Not until recent centuries, humans believed that the earth was the center of the universe, and commonly believed that the Earth was a flat disc covered by a dome and above the dome were the sun, the stars, and the moon. These heavenly bodies moved across the dome of the sky providing the light of the day and a marvelous display of mythology at night. 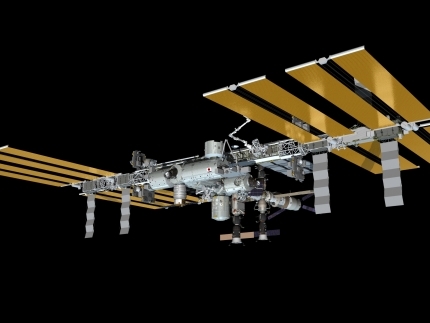 Now brave men and women hurtle around the earth at thousands of miles per hour in the International Space Station far above us. Rockets shoot satellites into the outer gloom so we can watch re-runs of “Gilligan’s Island,” provide magnificent telescopes to see the first light of the “Big Bang,” and send satellites beyond the solar system hoping to encounter other life forms. 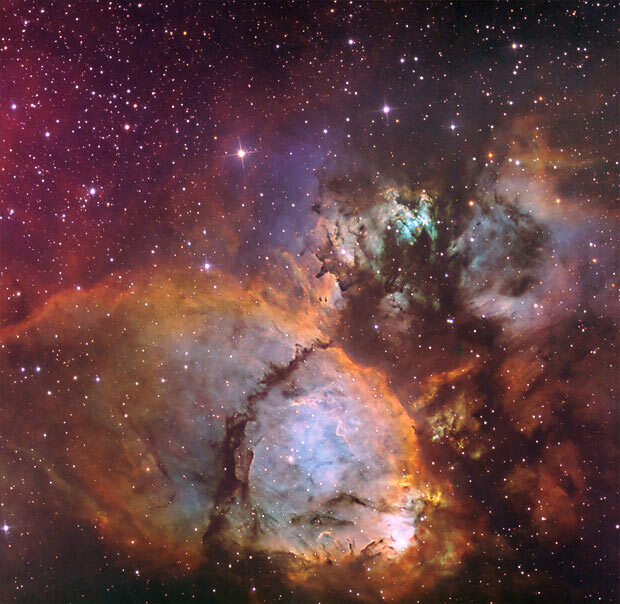 All in one century humans have explored the universe as never before. But in this mastery have failed to grasp its meaning and humanity has not mastered itself. Therefore, it is vital for humanity to return to the ancient Genesis creation story in order to gain for itself a more profound understanding. More than an attempt to teach history, the Genesis creation story teaches human beings about themselves. The creation of human beings as related in Genesis is told as a model of relationships between God and humanity, between humanity and nature, and between male and female humans. 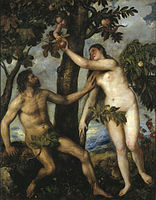 Adam and Eve by Titian. The creation story is told twice in Genesis. In the first account, a man and a woman are made simultaneously while in the second, woman is made from the rib of the man. There is more to the first two chapters of Genesis then the beginnings of human life. First we learn from the beginning the earth has been sanctified and is a sanctuary for life by the creative power of God. In these chapters time is measured and we learn something about humanity’s relationship to time. There is time for labor and time for rest. Humans can labor for six days, but must rest on the Sabbath and remember to keep it holy as God has sanctified the seventh day by resting. Resting is more essential to humans than to other species. Humans are more vulnerable to the powers of nature and must restore and reserve strength to meet the nature’s challenges. Because men and women were created equally by God and because woman was made from the rib of man, in the terms of an old Rabbinical teaching, the two walk side-by-side as equals. There is no evidence of male dominance in the Genesis creation stories—only that each was given different life duties to perform. Making a decision to become knowledgeable, that is eating the fruit of the tree of knowledge, the human life span is limited but the capacity to learn and know is limitless. In that limitless knowledge there must be an acceptance of the truths provided by new discoveries about our earth. A recent episode of Cosmos on the National Geographic Channel provided a picture of what the earth looks like when seen from the planet Neptune—the planet farthest out in our solar system. The Earth is hardly visible, a little blue dot on a totally black backdrop and barely discernible from other heavenly bodies. It is nothing more than a mote of dust, a fraction of a dot on the printed page. What are we to make of this reality? How does it fit into our grand sense of superiority—are we not masters of the universe? 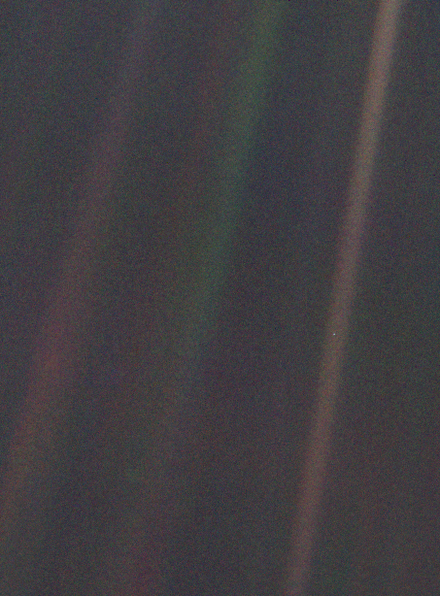 Earth as a pale blue dot in the middle of the rightmost band of light, taken by Voyager I from outside the orbit of Neptune. 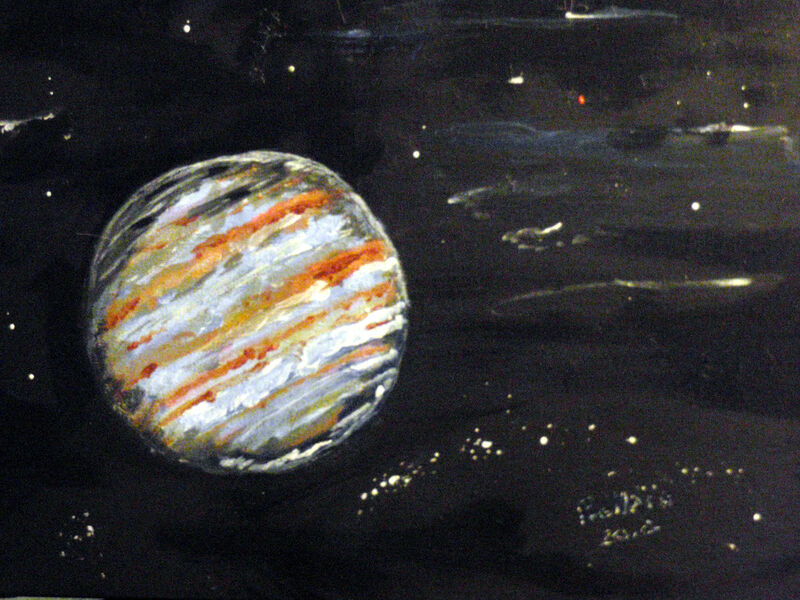 Jupiter – Acrylic on canvas – William Frank Bellais – 2012.
in space, possibly humanity would be less inclined to think it is the master of creation. The Cosmos commentator, story-teller, narrator, Neil deGrasse Tyson, poetically speaks of that fraction of a blue dot hanging in space as the only place we now know that has human life—or life of any kind—and we have a duty as occupants of that fragile dot to prevent the destruction of that life. While he says there is no outside force that will save us from our own folly and possible destruction, he religiously speaks of the Dark Force that keeps the universe in order and perpetually expanding; it is all a part of the black holes of imploding stars, and the inescapable gravitational power of dark matter. He further explains it is all a mystery, and that is all right, science loves a mystery. A black hole (center) in front of the Large Magellanic Cloud. Considering humanity’s place in the universe as fractions of a fraction of a blue dot provides perspective—perspective not available just two-hundred-years ago. That does not change the religious awe that still does and can exist when we think of the power behind creation—regardless of how the story is told. 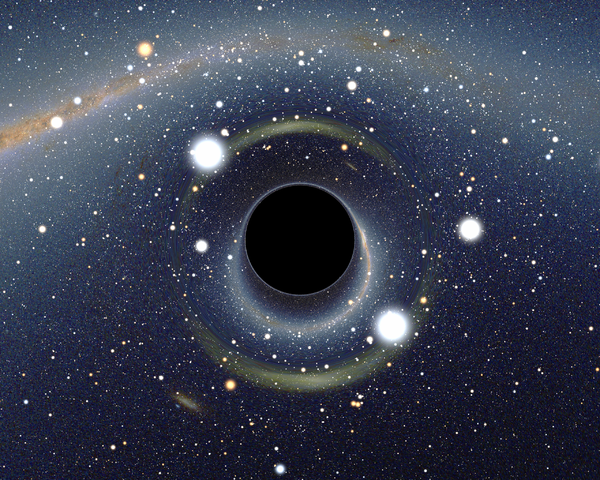 In the Book of Genesis, the story is that there was a great void and God, or as Dr. Tyson would call it, The Dark Force, needed to fill that void. Tyson’s Dark Force, which I like to think of as The Bright Force of Life, breathed meaning into the elements of the earth and from those elements sprang life. The universe is a mystery and even the life we live on this miniscule blue dot is a mystery. It is safe to say also that most Episcopalians love a mystery. There is a relationship between humanity and the Divine that cannot be explained by, with, and in astrophysics. The most important truth is that the earth is not the center of the universe; God is. That is, God is the center of every human’s existence and a life focused on God is complete. Out of the earth, woman and man were made and the spirit of that Bright Force of Life was imbued in them. Being descendants of that moment when human life was wrenched out of the dirt of the earth and given life, and as far as can be known now, the only such life extant in the whole of the universe, all life, therefore, is holy. The first creation story is Genesis 1:1—2:3. The second story is Genesis 2:4-25. Address of Pope Francis at Yad Vashem, 26 May 2014, cited by Bill Tammeus, “From God’s mouth to our ears,” http://billtammeus.typepad.com/my_weblog/2014/06/6-13-14.html  Neil deGrasse Tyson was born October 5, 1958. He is an American astrophysicist, author, and science communicator. He is currently the Frederick P. Rose Director of the Hayden Planetarium at the Rose Center for Earth and Space and a research associate in the department of astrophysics at the American Museum of Natural History  The author is an Episcopal priest and added this remark so that the Christian connection to his thoughts is clearly seen.